Patients get on average just 10 minutes allocated with their doctor and that is frankly just not enough time to ask detailed questions about your health condition, even if you could organise your thoughts when faced by the white coat. Most people are too scared to make appointments with healthcare providers simply to find out more about their condition, how to best manage it or find out the latest news and information about it. You can spend hours and scare yourself stupid randomly browsing the internet and uncover some dubious information from less than authoritative sources, or get sucked in by snake oil salesmen who prey on your fear and lack of expert knowledge to sell you poetess, ineffective, potentially dangerous and usually expensive "cures." So where do you got for reliable information, the latest health news, articles and conversations with experts and other people with the same conditions you are interested in? 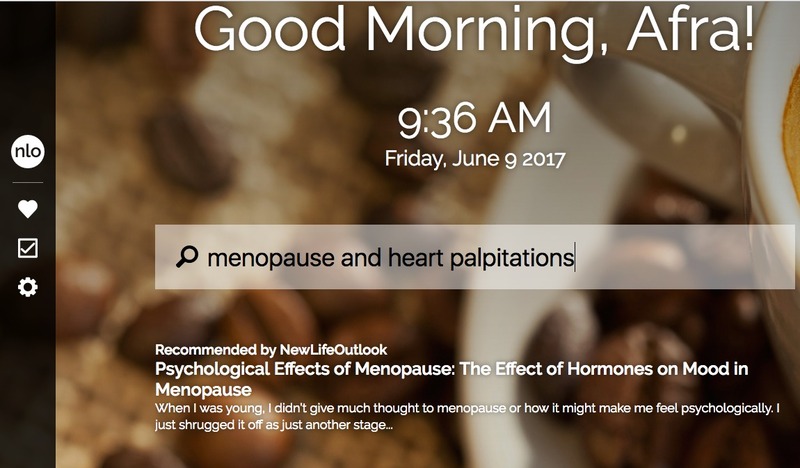 I discovered NewLifeOutlook (NLO) years ago and was amazed to find the site covers just about any chronic health and lifestyle issue you can think of like diabetes, lupus, menopause, ADHD, migraine, bipolar... so many conditions I can't list them all. There's a great community aspect to the site as well as expert information and the resource's motto is "Together We Are Strong" which I thought was inspirational and very reassuring. I signed up for information about the conditions I was interested in and currently receive regular emails and Facebook updates which have proved very useful in the past. Articles I have read include how to manage diabetes during the holiday season, menopause as it is portrayed in the media, can cinnamon help with diabetes?, anger issues in menopause and of particular interest to me at the moment, articles on how menopause and diabetes can affect your heart. 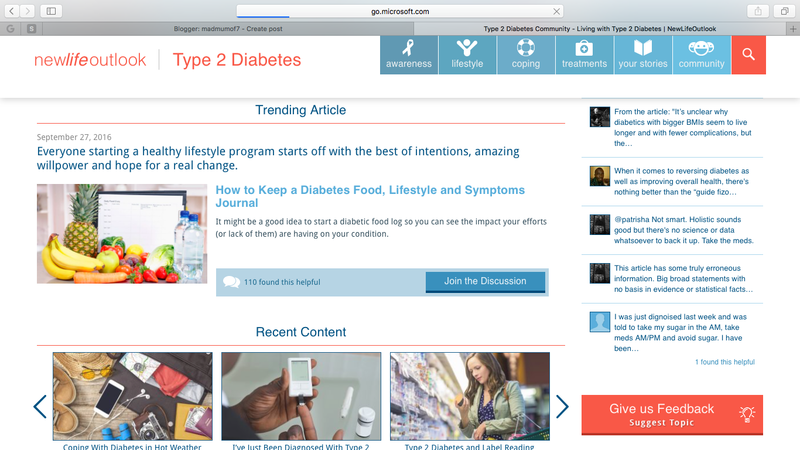 To make exploring the site even easier NewLifeOutlook is just about to release a browser extension for Google Chrome through the Chrome Web Store and this week I got a sneak peek at it. From the start the browser is simple to navigate - I inputted my name for a more personal experience then chose a selection of news providers and health conditions I was interested in - these can be easily edited at any time so don't panic too much about making final choices! The installation process took me smoothly through the stages of customising the browser for my best experience then all that was left to do was explore the vast amount of resources now at my fingertips. I liked the calming background (although if you don't you can change it) and liked that I could choose NLO articles and news pieces or look at external sources all via the browser. And if you need inspiration on a down day there's even a timeline of inspirational quotes and memes to bring you strength and maybe even a smile or two. Previously I felt the site was OK to navigate if you only wanted to read about one condition but feel the new browser makes it much easier to have information about my many health conditions at my fingertips. And if I develop more conditions I can add them too. Went to the newly opened great location and received excellent service. The sales associates were incredibly helpful and informative about specific ways to use this kratomsensation product. They were even able to suggest something to help me.